Recently, enVista had the opportunity to implement a retail software solution through its Enspire Commerce platform. Microsoft Dynamics for Operations served as the backend ERP supporting the financial and procurement processes using an enhanced integration layer (enVista’s EIF platform). The result was a seamless solution supporting all sales, procurement, customers and financial management. The following explains the opportunity, solution, and what value was added due to the project. As a retail company grows, the need may arise for it to add additional selling locations or channels (e.g., e-commerce) to expand its ability to capture more of the market. This usually creates a need for software capable of running daily operations. It is possible that different locations of the same retailer could be operating a different point of sale (POS) system from the other locations and that the e-commerce channel is not coordinated with the physical sales channel. Such a lack of standardization and integration can have a major impact on the overall efficiency and reliability of a retailer’s operations. Purchasing depends on emails and Excel files to determine what needs to be ordered and will not optimize its total spend. Real-time inventory visibility and accuracy is difficult – requiring time and effort to collect and report information to management. Standard sales order processes do not exist resulting in inconsistent results or the inability to manage cross channels. Month-end financial closings can extend from a few days to several weeks. This retailer needed to focus on a solution that reduces manual entry, provides consistency of the data across disparate systems and reduces the administrative work that departments like Purchasing must perform. The solution implemented for the retailer involved a unified commerce solution consisting of a common multi-site POS and an e-commerce solution both feeding a common platform for servicing all commerce patterns. Additionally, the client addressed its reporting and analytics needs through a single business intelligence tool (Targit) that was already integrated with the commerce platform and connected all data sources. The result: a common data intelligence tool with all data accessed through common reporting and dashboards. These tools provided the ability to manage key metrics, see information sooner and ensure data integrity increased dramatically. The diagram below reflects the end solution for dramatic process and operational improvement. The reatailer realized a better experience and options. Employees are more efficient and customer service focused (less administration). The Purchasing Department was more effective in reducing costs through more consolidated buying. The month end reporting was reduced to a few days rather than several weeks. Manual tasks used for data entry or other system activities, such as placing an order, were reduced or eliminated resulting in less labor. Inventory was available for store managers across all locations with a standard process for order entry occurs across all stores. Information is more readily available, timely and useful. Finally, upgrades to different pieces of the solution are more achievable now since one single solution is more manageable than the original, disconnected systems. 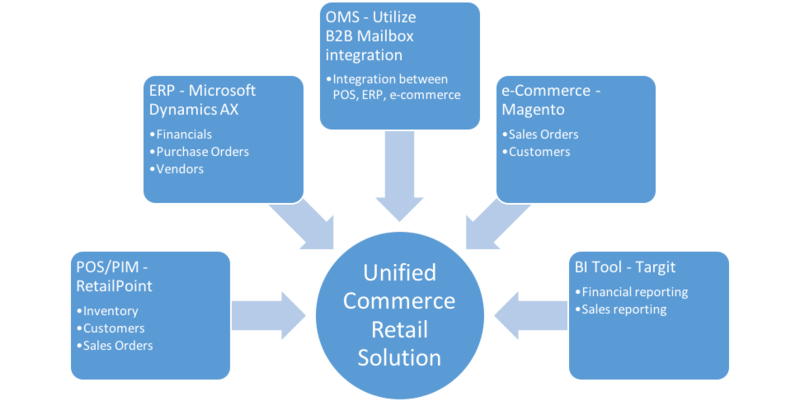 For more information on how you can choose the right retail solution software, visit Enspire Commerce.